We now try to establish the chronology of the formation of the Vedic World. Historians lament that the Vedic Indians were terrible in keeping the records (as against the Egyptians and Greeks). The reason behind this could be a very long history before the establishment of proper monarchies wherein the Monarchs might be interesting in keeping their histories, real or invented, preserved for the posterity. Another reason could be the inherent nature of Vedic thought, which was more concerned with spiritual exploration and search, than about empire building. The affiliations of later scholars also did not help much. Christian scholars found it hard to accept a world before Genesis, which was around 4500 BC. Communist scholars, which India had post-independence, had their own agenda in deriding the history which can only be called the Hindu history of India, much to their chagrin. Many contend that the Aryan History began around 1700 BC (European point of view). This is a point which is widely contested and as we dig deeper, we find it to be incorrect, derived merely because we have 900 BC as the time of Atharva-Ved and by assigning equal duration to each Veda (Max Mueller formula), we arrive at 1700-1900 BC for the Rig-Veda compilation. Now, we have two issues here. One, the history of Aryans goes beyond their first arrival into India; two, even the time estimated of their arrival into India around 1700 BC is unscientific. Going by amazing analytical works of Lokmanya Bal Gangadhar Tilak in to the Aryan history, which sets the dates based on the Rig-Vedic references (Cross-referenced to Persian writings) and Astronomical details in Rig-Veda, we begin reaching somewhere. He fixes the date for the compilation of Taittiriya Samhita in what is refers to as Krittika period, that is 2350 BC. Rig-veda obviously, being older, must go to somewhere around 3000 BC. What Tilak further posits is that while Rig-Veda might have been compiled around 3000 BC in India, it was written for centuries earlier as it has the references to the earlier habitat of the Aryans, that is Arctic. This thought aligns with the idea of Shri A K Majumdar. This takes into account the rule of Manu, The First, or Adima (Adam) in Uttara Kuru (Siberia or Arctic) till around 8000 BC. Some of the hymns of Rig-Veda were written during those times which refer to six-month long day and night. A devastating winter forced them to move, as they settle down in central Asia crossing Roosam (Russia) by 4000-5000 BC, before again splitting in parts and moving in various directions and some reaching India around 3000 BC. Those moving west-ward settled in Egypt and Greece. Dyaus of Aryans became Zeus in Greek, Dyauspitar (Father of the Gods) became Jupiter. Atharvans light up the sacrificial fires in India and Athravas in Iran (Ariyanna- Land of the Aryans) to ward of chief of evil spirits, Vritra, in India and Veretra in Iran. There was huge moral fall, devastation and general lawlessness in the new Aryan settlements, considered as the beginning of Kalyug- the Age of moral decline which as per Hindu thought continues. This was around 2900 BC. Brahma at this time, disappointed, directs his sages, who were the fountainhead of intellectual morality, to go ahead, marry and take civilization forward. Essentially, he asks the sages to join the mainstream and work with the society to bring the order back. Around a century down, the first Monarchy will be formed, headed by Manu-II, while the Brahma of the time, had retreated back to the Uttara Kuru (Siberia), named after the illustrious leader from the Arctic days, also called Swayambhu Manu. Between 5000 to 3000 BC, the Aryans were spread across Asia, and Vairaja dynasty ruled in Central Asia, called Brahmavrata. Manu and his wife, Satrupa, had two sons- Priyavrata and Uttanpada who, it is said , between two of them, ruled the seven islands of the world (Bhagwat Purana). This was probably the first example of a federal government and first reference to the seven continents. There were independent kingdoms, all ruled under the same policies and rules, with Manu Samhita as a singular constitution governing them, run independently. Even within Aryavrata (Indian State, or Jambu-Dwipa) we shall see that there were multiple kingdoms, all together as a singular entity called Aryavrata and later, Bharat-Varsha. He also had three daughters- Akuti, Devahuti and Prasuti. Devahuti was learned woman and also contributed hymns to Rig-Veda. Prasuti was married to the king Daksh (This is considered to be the first marriage to be solemnized), while Akuti to Sage Ruci and Devahuti to a very poor Sage Kardama who lived on the banks of Saraswati. Sage Kardama and Devahuti had Nine daughters and a son, named Sage Kapila, who is considered to be world's first Philosopher and the founder of Sankhya philosophy. His philosophy was near atheist and believed in liberation through spiritual emancipation. He did not believe in higher Gods and Vedic sacrifices. He believed the understanding of the Self as the way to liberation. Priyavrata had ten sons, out of which three denounced kingdom and became Sages. Priyavrata divided his kingdom among the remaining seven as- Jambu-Dvipa (India) to the eldest Agnidhara, Plaksha (now submerged part of Africa), Salmali (Likely modern-day Somalia), Kraunch-Dweep (Australia), Saka-Dwipa (Europe), Pushkara-Dwipa (North America), Kusha-Dwipa (South America). Agnidhara ruled over the Indian Peninsula as Viceroy of Priyavrata from 2875 to 2850 BC. Agnidhara was followed by the Prince Nabhi who ruled from 2850 to 2840 BC and then handed over the reigns to son, Rishabh Dev. Rishabh Dev denounced the kingdom and became a sage in 2825 BC in search of what he called Pure Wisdom. He was later hailed as first Jain Tirthankar. Bharat ascended to the throne in 2825 BC. India came to be called Bharat-Varsha after him. The dynasty declined after Bharat. Uttanpada dynasty had 14 kings but none of them noteworthy. Under the guidance of Vishnu and under the military command of Indra, Aryans moved towards India. Marichi, the eldest of the Seven Seers, Saptarishis, who were asked by Brahma, the great Aryan Patriarch, to get into the worldly ways, had a son, Kashyap, who conquered the mountainous, Kashyap-Meru (Kashmir). He married daughter of King Daksha, of Kanakhla (Haridwar), Aditi, and had twelve sons, of which Indra, Varuna, Vivaswan and Vishnu were the most illustrious. Brahma had by then settled back in Siberia at Siddhapuri (Sidrov). Vivaswan, a poet and thinker, had a great son, Manu, who came be known as Vivaswat Manu. Vaivaswat Manu, ruled from 2800 BC- 2790 BC. He built the city of Ayodhya, on the banks of river Sarayu , which had Eight parts, Nine gates and and iron treasury (Atharva Veda). He founded solar dynasty (Suryavanshi) had 58 great kings, with names like Ikshvaku, Prithu, Satyavata (Trishanku), Harishchandra, Dilipa I, Bhagiratha, Sudasa, Raghu, Dasaratha and finally, the greatest of the Kings, Sri Ramchandra of Ayodhya. Sage Atri, who was the second of the Seven Seers, had Som as the son. Som conquered the Central Asia and North-west India. Som begot an illicit son with Tara , the wife of Sage Vrihaspati, named Buddha. He married Ila and founded Lunar dynasty (Chandra Vanshi). This dynasty had 50 Kings and ended with Duryodhana. This was followed by Pandu dynasty with the coronation of Yudhishtira in 1388. This dynasty ended in 1372 BC. The sixth great king of the dynasty, Yayati (2700-2650BC), had Five sons, and each founded great dynasties. Puru, Yadu, Druyhu (Bhoja of Malwa), Truvasu (Western India, later known as Yawanas, they eventually settled in Greece) and Anu (He too went westwards and founded Mlechcha Pradesh). Around that time, a great Bharat clan King, Sudasa ruled in North-west India, over the tribe of Tritsu (some say, Sudasa was a non-Aryan king, but was supported by Indra in the battle of 10 Kings. Also we do not know if Indra as a person supported him or was he benefited in the battle due to massive rains, Indra being the rain God. It is also said that Anu drowned in the river during the battle). He once defeated the joint army of Anu and Druhyu, and at another time and more significantly, he defeated a joint army of Ten Kings, who had stolen his Cows and were taking them across the rivers. 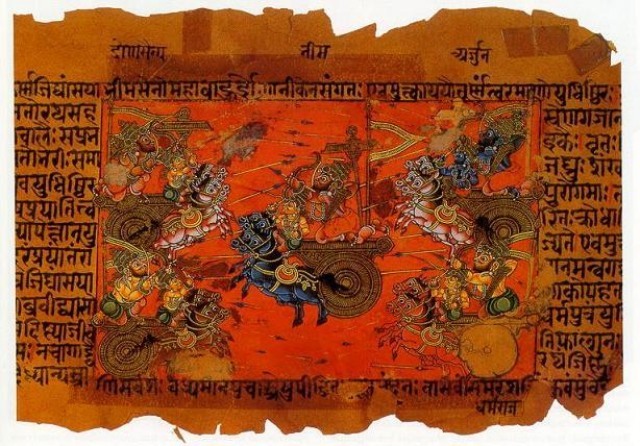 In the first great fight of Vedic India, he killed 6000 soldiers in what is known in Rig-Veda (7th Mandala) as the Battle of Ten Kings (Dasrajnya) in which the King Puru too perished along with Janmejaya. "The Tritsus in whose ranks Indra entered, went onward like downward streaming waters; their enemies leave all their goods to Sudas. Sixty hundred of Mounted Anu and Druhys perished; Sixty six heroes fell before the righteous Sudas.. The four horses of Sudas, the courser worthy of praise, richly adorned, stamping the ground, will bring race against race to glory. Ye strong Maruts, be gracious to him as to his father Divodasa, preserve him to the house of Pijavana, and let the power of the righteous king continue uninjured." However, the great Lunar dynasty continued further, now with areas of influence settled; other great names adding to a distinguished dynasty like Dushyant, Bharat, Shantanu and Bhishm. Bhishm and Dhritrashtra were not full-kings, rather were Regents, Bhishm had opted out of it, and Dhritrashtra was not considered qualified to rule given his physical deficiency, being blind in the time when the King was also supposed to be a Military commander. Brihadratha dynasty- 1304 BC- 779 BC, Starting from the reign of Brihadratha, father of Jarasandha. Brihadratha was the eldest of the Five sons of Chedi King Uparichara Vasu, who ruled somewhere around modern-day Bundelkhand. After this the world becomes more plausible, and India, that is Bharat, becomes more recognizable, beyond the deliberate attempts to disfigure it made by vested interest. Keep reading.